If you've ever owned a rifle before, you'd most probably know by now there are only five things you can really do with it. You can point it. You can shoot it. You can clean it. You can mend it. And you can ride with it for 84 minutes in 1955. Yeah. Straight up! If you think I'm lying, why don't you ask the Director: Carl K. Hittleman; or the Actors: Chill Wills, Lance Fuller, and Cathy Downs. Go ahead, make my... BOOOM! 'Go on ahead' said Jason Clay (Lance Fuller) to the rest of the wagon train he was a part of. 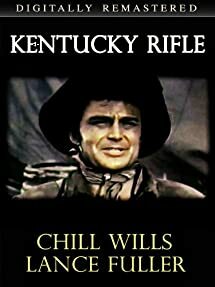 'Me, Tobias (Chill Wills), plus some other folks I'm riding along with, will all stay behind' he continued 'just long enough for me to fix up my broken down old wagon full of brand spanking new Kentucky rifles'. But no. I'm afraid to say this plan doesn't really pan out for him in the way he hoped it would. Following a night full of mirth and misadventure, Jason suddenly discovers that the Comanche's have them in their sights -- or more specifically, their rifles. And so -- over a period of time -- this somewhat devilish pack of savage's talk with them, fight with them, yet ultimately find some peace with them, just long enough for everyone to rest up for a short while, and... TWANG! ARRRGHHHH! Oh no! Not again! Not another Comanche attack! Still. That's most probably why what next transpires all rolls-on when a fool makes a bargain with some devilish Comanche's. As bargains come at a price - battles aren't very-very nice - a birth lingers on in the air - and when an old cowboy dies you know for a fact that life just isn't very-very fair. Now when I first read the premise behind the 'Kentucky Rifle', I said to myself 'Great. I love this type of film I do. I hope to God that it will be one of those rip roaring yarns chock full of adventure, character, and all of that stoic splendor which normally comes along with this sort of earthy production'. But no, folk's. In part I was wrong. Very-very wrong. After I watched this Western I found out that there were parts of it I did enjoy watching -- mainly it's rather simple story-line, some of its more character driven moments, plus that whole 'baby dilemma' too. However, in the same breath, there were parts' of it which I thought were completely off the mark as well. Well. Let's face it. If you're going to relay a somewhat simple narrative, you have to make sure that the characters in it have some depth to them or you can relate to on a certain level. Granted. There were two members of the cast whom were quite charming to follow. Although I hardly understood anything Chill Wills actually said, I still liked the cut of his jib, so to speak. Then again, I have to also mention that I enjoyed Lance Fuller's performance, because he presented himself in a very 'Charles Bronson' like manner, and he had that brooding but mannered intensity that I really did get a kick out of. But as for the rest of the cast on the other hand -- nah -- not my cup of tea at all. They were either too one-dimensional, too zany, or too prim and proper to care less about. Also, if you factor in how the Native American protagonists were depicted throughout this entire picture -- ouch -- all I can say about that is that I personally thought this was a very racist depiction! Yeah. No kidding. When you hear a character saying things like 'Never trust a Comanche' or 'All this pack of savages ever want to do is kill us', you know nigh on straight away that this isn't what you would call a very politically correct production. Hey! Don't get me wrong. I know full well that this movie was made during an era where playing 'Cowboys and Indians' was all the rage. And that it was more common place to hear this type of remark without having a bitter taste in your mouth afterwards. Nonetheless. I can't say this sentiment is still true in these more modern times. It felt very racist to me. Plus if I'm going to be completely honest about it, on occasion it did spoil my enjoyment of watching the 'Kentucky Rifle' an awful lot. Anyway. I best come off of my high horse now. Or otherwise I won't have enough time to spill these filmic facts. (1) 'Howco Productions Inc.' first screen this movie in New Orleans, Louisiana, on the same day Egypt announced its plans to sell cotton to Communist China -- the 27th of April, 1955. (2) The traditional song sung by Chill Wills in this film, 'Sweet Betsy from Pike', was originally written in 1858 by John A. Stone. (3) Most of this production was shot on location within the American state of California. This includes Santa Clarita, plus Vasquez Rocks Natural Area Park, Agua Dulce. (4) This was the first feature film the producer, Carl K. Hittleman, ever directed and co-wrote by himself. Later on in his career he produced 'Gun Battle at Monterey' with Sterling Hayden, and 'Big Daddy' with Chill Wills. (5) Lee Hewitt, who was one the other screenwriters assigned to this project, also wrote for such television shows as 'Science Fiction Theatre' and 'Holmes and Yo-Yo'. (6) The tagline used to promote this Western, was, 'His Wits, Weapons and Women, Turned Defeat Into Victory!'. (7) For the two whole years Yolanda McGinnis worked in the business, the only thing she did was hire the cast for two of Carl K. Hittleman's movies. This one, plus another one called 'The Buckskin Lady', starring Patricia Medina. (8) Once this flick sauntered over the horizon, Chill Wills starred in the TV movie, 'The Over-the-Hill Gang'; Lance Fuller starred in the sci-fi flick, 'This Island Earth'; and Cathy Downs starred in the drama, 'The Promise'. 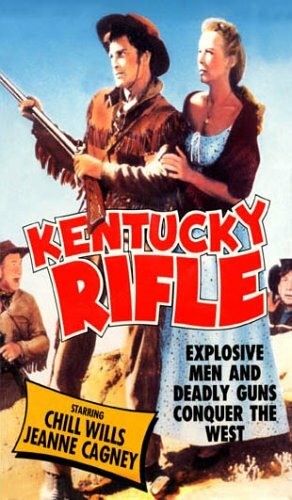 Overall the 'Kentucky Rifle' was a pretty so-so film. The story was a simple one. The characters were a mixed bag. The direction was fairly substandard. And by in large it wasn't a bad film, yet it was a misguided one at best.